Sierra is featured in a new documentary about her mandolin hero, Sam Bush. Not many musicians can lay claim to being the 'father' of an entire genre of music. Sam Bush can. Widely considered the 'Father of Newgrass', Sam has become the icon of his own genre. From jam bands to Chris Thile, from the Avett Brothers to Zac Brown, many of today's biggest acts in Bluegrass, Newgrass, and Americana owe a debt of gratitude to Sam. 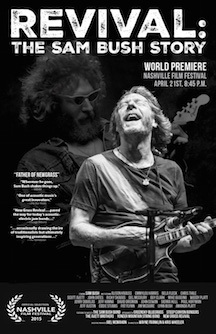 Revival: The Sam Bush Story, just celebrated it's world premier in Nashville, TN as part of the Nashville Film Festival. Sierra alongside Emmylou Harris, Alison Krauss, John Oats, Bela Fleck, Jerry Douglas and others were in attendance to walk the red carpet and show their gratitude and respect. Fans still have a chance to view the film tomorrow night, April 24th at the Green Hills Cinema in Nashville. Tickets available HERE! For more information on the film, visit the official website HERE!